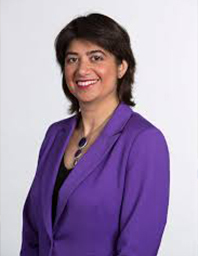 Seema Malhotra was elected Labour and Co-Operative Member of Parliament for Feltham and Heston in December 2011, and re-elected with an enhanced majority in both 2015 and 2017. Her most recent role has been as a member of the Parliamentary Select Committee on Exiting the European Union. Seema recently served as Shadow Chief Secretary to the Treasury and continues to keep an interest in economic affairs, productivity, how we grow and share prosperity and youth education achievement. From 2014-2015, she served as Shadow Home Office Minister for Preventing Violence against Women and Girls where she led on aspects of the Serious Crime Bill for Labour. She has also been an Opposition Whip and Parliamentary Private Secretary to Rt Hon Yvette Cooper MP, who is now the Chair of the Home Affairs Select Committee. Prior to entering Parliament, Seema was a freelance business and public service adviser working with the video game and film industries. She has over ten years’ experience with leading firms Accenture and Price Waterhouse Coopers working in strategy and IT systems development. Seema has worked across Whitehall with justice agencies and creative industries.She is a founding member of the Cross Party Group for West London.